Sidney-by-the-Sea is located at the tip of the Saanich Peninsula, on the Southern part of Vancouver Island, minutes away from the Victoria International Airport, Swartz Bay Ferry Terminal (to Vancouver & Gulf Islands) and the Washington State Ferry (to Anacortes, WA & the San Juan Islands). The area is a favorite destination for cyclists, boaters, and hikers alike with its fantastic cruising areas, and cycling and hiking trails. Leave your car behind and explore the town on foot. Browsing the main streets with its many book shops you’ll discover why it is called Book Town . Sit back and people-watch while sipping a cup of coffee on an outdoor patio at one of Sidney’s fine coffee houses on the main street, or have a beer and great meal at one of the neighborhood pubs on the waterfront. Whatever your taste, casual to formal, area restaurants specialize in everything from fresh seafood and West coast cuisine, to the ethnic foods of Mexico, Greece, Japan, and Thailand. Shop the many fine clothing boutiques, find that art piece you have been searching for at one of the local galleries, or perhaps it’s a unique accent for your home that you’re after, Sidney has some great furniture and accessory stores too. Maybe you just want to unwind and de-stress, why not pamper yourself at one of the Spas around town, making your relaxing get-away to Sidney complete. Add to all this, Sidney Thursday Summer Markets, the Fall Fair, Local Wineries, the Lavender farm, the Christmas Sail-Past. Add the Shaw Centre for the Salish Sea and you have a year round destination. You’re sure to want to come back and visit Sidney by the Sea again. 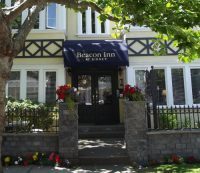 5-Star B&B luxury in the heart of quaint Sidney by the Sea. 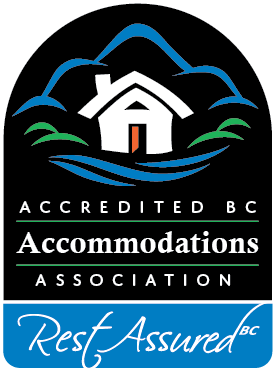 Centrally located, close to Victoria, Butchart Gardens, BC and WA State Ferries, marinas and Victoria Airport. Stroll to many unique local shops, eateries, coffee houses and the waterfront.Modern, mock-heritage, adult-oriented property.